Eclipse at the Beach: Memory Monday August 21, 2017. Greetings from a hot and sunny Sandbridge Beach. It is a beautiful day here at the coast today, but of course as everyone in western civilization is aware there is a total eclipse of the sun this afternoon and we are expecting 87% coverage at approximately 2:45 this afternoon. We can’t wait to see this special event, and what a great week the people staying here this week picked. 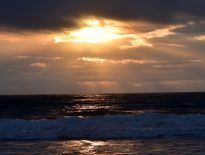 Wonderful beaches, soothing ocean water, and a solar eclipse too! We understand that it will be 700 years until the next eclipse that goes from coast to coast in the United States so today is truly a special day. 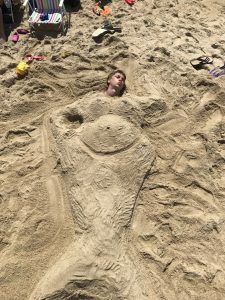 Speaking of unusual sights…here’s a Mermaid sighting right here on Memory Monday! 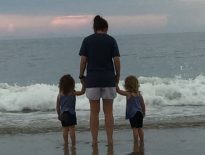 Special thanks goes out today to Marie Marchetti of Ridgewood, New Jersey who stayed with Sandbridge Blue recently and captured this special moment that her whole family pitched in on to make this work of sand art on the beach. Don’t forget there is still time to get your own late summer getaway place in Sandbridge. While we can’t promise you a solar eclipse, we can definitely promise great weather and a good time. We look forward to serving you. Previous Previous post: Family Time: Memory Monday August 14, 2017. Next Next post: Sunrise: Memory Monday August 28, 2017. Memory Monday Photo Contest	Sunrise: Memory Monday August 28, 2017.